Giacomo Puccini’s 1896 Italian opera La bohème has seen many forms in the century since its first performance in Turin. The story–itself borrowed from Henri Murger’s 1851 collection Scènes de la vie de bohème–has been retold in many forms, with and without the music. It’s been made into films, produced in countless venues featuring storied performers like Enrico Caruso and Luciano Pavarotti, and even found its way to Broadway in the form of Jonathan Larson’s modernized Tony-winning 1996 adaptation Rent. The tale of Rodolphe and Mimi’s tragic love affair is a universally appealing one, one that celebrates the carefree artistic lifestyle while also serving as a cautionary tale, of sorts, of the dangers of foolish pride and jealousy. In 1926, director King Vidor brought the lovers’ story to the big screen in a silent version starring Lillian Gish and John Gilbert. This was not the first time the tale had been filmed–a French version had been made in 1912, and an early American version, starring Alice Brady and written by Frances Marion, had premiered in 1916. But Vidor’s version, highlighted by the performances of his talented cast and some truly lovely camerawork, remains the definitive silent treatment of the material. Vidor’s take on La Bohème follows the plot of the opera fairly consistently. Rodolphe (Gilbert), a struggling playwright, lives in a garret with three other (literally) starving artists: Marcel (Gino Corrado), a painter; Schaunard (George Hassell), a musician; and Colline (Edward Everett Horton), a philosopher. The quartet barely scrapes by, sometimes resorting to manipulating Marcel’s lover, Musette (Renée Adorée), into feeding all of them. Rodolphe becomes infatuated with the poor, lovely seamstress Mimi (Gish), who lives in an attic room next door. The two begin to fall in love, and Rodolphe is inspired to work on a new play. Soon, Rodolphe’s insane jealousy of Mimi’s wealthy client/would-be suitor, Vicomte Paul (Roy D’Arcy), causes him to cast her aside, and despite his later remorse, Mimi flees into the slums of Paris, vowing to return only when Rodolphe’s play becomes a success. But by then, it’s too late for their doomed love affair, as a weakened Mimi becomes ill with the deadly consumption on the eve of Rodolphe’s greatest triumph. In 1925, Gish signed a six-film contract with MGM, with La Bohème marking her debut at her new studio. At nearly thirty years old, she was moving into the second decade of a long career, and she was determined to do things her way. Indeed, her new position allowed the actress a level of control over her films that she had never before experienced. Gish had learned her craft under the watchful eye of D.W. Griffith, and she had become used to doing things a certain way–and one of the things she insisted upon doing was holding a rehearsal before filming. It was a relatively unheard-of practice at MGM, but Vidor agreed to indulge his leading lady’s whims, at least for a while. Gish also had no qualms about voicing her disapproval of the sets and costumes, which she judged too lavish for the film’s characters: “These are poor Bohemians,” she later recalled. “They can’t live in a big, beautiful house.” She got her way in that matter as well, infuriating costume designer Erte when she arranged to have appropriately shabby costumes made by someone else. Gish had agreed to work with Vidor on the basis of his work on 1925’s The Big Parade, which was shown to her by MGM wunderkind Irving Thalberg as a way to pique her interest. She subsequently requested that the film’s stars, Gilbert and Adorée, serve as her co-stars in Bohème as well. Gilbert, who had a noted habit of falling for his costars, reportedly echoed the love his character displayed for Gish’s; by the actress’ own account, Gilbert proposed to her during the making of the film, though she promptly turned him down. All told, Gish took on a rather standoffish air while filming, something that did not exactly endear her to her costars or her director. She even refused to film love scenes with Gilbert, thinking that chasteness onscreen would better build the tension between the lovers–an attitude that stymied Thalberg and studio chief Louis B. Mayer. Gish’s take on Mimi is an odd mix of innocent and coquette, naive and worldly. As an orphan, with no family or friends to speak of, the character has long fended for herself, and is quite capable of doing so despite her poverty–if her ability to escape the amorous attention of the landlord and the Vicomte is any indication. Gish plays her shyly at first, timid and unsure, before gradually growing more confident and open through her love for Rodolphe and her determination to help him succeed, in spite of the cost to herself. But what’s lacking in Gish’s performance is pure and simple heat. Gish’s determination to highlight the virginal qualities of the character belies the innate sexuality behind the romance of Mimi and Rodolphe (by contrast, something that is taken to almost absurd heights in Larson’s Rent). And that standoffish stance the actress took with Gilbert in real life is clearly reflected in the lack of chemistry onscreen, despite a passionate portrayal of jealousy and banked lust on Gilbert’s part, which Gish–by design, it seems–just does not match. Still, despite the difficulties presented by Lillian’s increasingly dated insistence upon cinematic chastity, Vidor recognized the immense talent bubbling underneath the sometimes-cold exterior, later claiming, “The movies have never known a more dedicated artist than Lillian Gish.” Indeed, Gish threw herself wholeheartedly into filming La Bohème, and according to Charles Affron’s 2001 biography of the actress, subtitled Her Legend, Her Life, nowhere was her dedication more apparent than in the filming of Mimi’s death scene. Gish researched the effects of tuberculosis to better portray her character’s dying motions; Vidor later stated that she had fasted for days and lost so much weight prior to filming that he feared she would actually die before he could even film the scene. The cast, particularly Gilbert, was mesmerized by what they were witnessing: “Lillian seemed to have stopped breathing; the movement of her eyes and eyelids was suspended … for what seemed like minutes, Lillian was inanimate” (p. 210). Her gaunt appearance–hair mussed, eyes bruised, weary with pain–is lit beautifully in these final scenes, with an almost otherworldly aura of serenity surrounding Gish as Mimi breathes her last. It is a bravura performance all around; the emotional finale even brought Mayer to tears when the film was screened for him. Note: La Bohème is available on MOD DVD through Warner Archive, but there are some flaws that unfortunately prevent this from being one of the better Archive prints. There is some fuzziness in certain scenes, and some blinking of the screen that makes the movement almost staccato at times. More problematic is the flashing of the title cards, some of which appear for a mere split second before disappearing, far too quickly to read without rewinding and pausing. 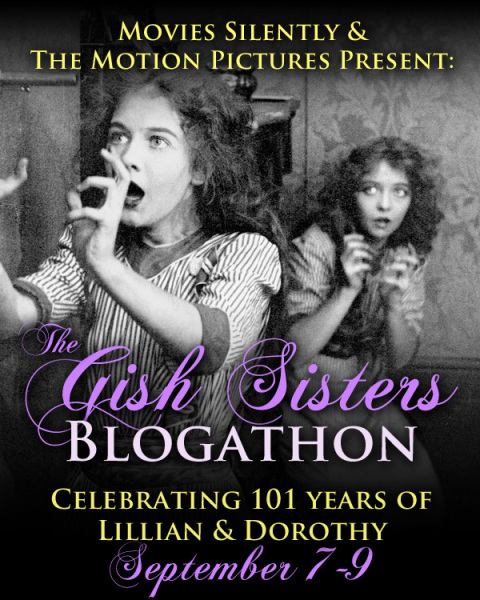 This post is our contribution to The Gish Sisters blogathon, hosted by Movies, Silently and The Motion Pictures. Check out the list of participants and join in the celebration of Lillian and Dorothy’s immeasurable contributions to the world of classic film and beyond. Bringing The Scarlet Letter to (silent) life. Thanks so much for joining us in the blogathon! I always found Lillian’s Erte battles to be quite amusing 😉 Marvelous bit of research, I really enjoyed all the anecdotes about the production. A pity that a nicer print is not available. Good observations on the movie. Mimi’s death scene still lingers in my mind many years after seeing it. I have seen that problem with softness in prints of other MGM movies from the 1920s. Thank you for sharing. I could not agree more! The death scene is one of Gish’s greatest moments, and certainly atones for her sometimes off-the-mark approach to Mimi’s character. Excellent post. I really must see this! I have enjoyed La Boheme at the ENO several times, this has convinced me I need to explore the celluloid versions too. Thank you for sharing! This film is very good! And also very sad. I’m glad Lillian was picky in MGM, because part of the prefection of her latter silents deppended on this. And I agree that her Mimi is too pure.